What a fantastic collection, jmb – Happy New Year! Merry Christmas today to you and your family. I love your rock collection. You have some beautiful pieces. I hope your new year is off to a good start. Certainly a wonderful impressive collection. Christmas now seems so long ago. Happy new year to you. 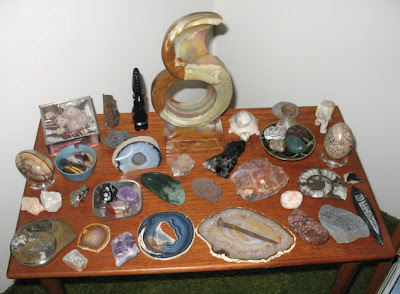 The picture of your rock collection did bring me memories of my father who was a collector of stones. I have a few of the collection in my livingroom. My father passed away some years ago. I wish, I’d saved them …or maybe some of the stones he tumbled for us … sigh. What a beautiful collection, jmb! I never thought about collecting rocks from places I visit. Lots of photos, though, and usually one special piece from each country. All looks invitingly touchable. Love that you also have rocks that (used to ?) have a scent, hadn’t thought of smelly rocks before… sulfur is not exactly a popular household fragrance, maybe you are glad they have lost their aroma? 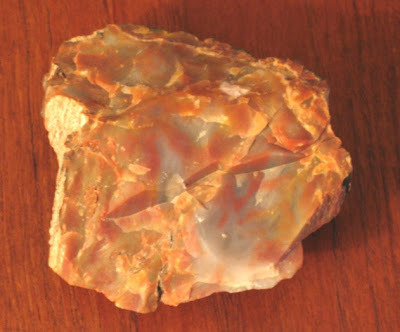 Never saw the jasper before but it is easy to see why you like it so much. 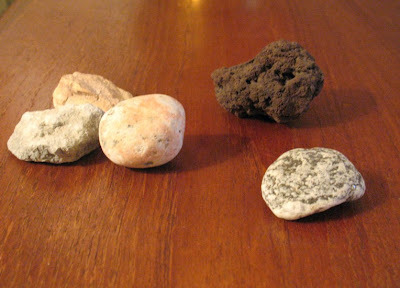 I have a collection of stones but they’re just ones I’ve picked up from beaches. Happy Christmas on Jan 7th. I hope it was a good one. Thanks, it’s a bit strange but it means something to me. New Year off to a rocky start, so it should get better. Thanks, it seems that many people do collect rocks. Probably not ecologically sound really. There is nothing so over as Christmas, is there? Happy New Year to you too. I’m glad you kept your father’s rocks. I don’t know that my children will keep mine. We collected some stones that a friend tumbled for us too. They are there on the table but I don’t know which ones. I haven’t picked up too many rocks really, I don’t think we can all cart of a rock from wherever we are else there would be none left. I do hope not, even this representation would give me a concussion. Although I was hit by a meteorite recently! Happy New Year to you. I hope I am lucky. No I don’t need a bobcat yet. I also have some frankincense and myrrh but both of those have lost their fragrance. Those are the best kind, the found kind. Although some of mine were “found” in stores. I have a rosetta stone my son found on a hike. They are somewhat common here in Oklahoma, and they have a scent. That, surprised me. Not only do they look like a rose, but they have a pleasant scent. He wanted me to find someone to polish it and get it smoothed out ..and I don’t want to, I like the porous look as well as it’s natural scent. I love the leopard skin Jasper. I’ve never seen anything like it. How did you get that blog roll on your site? Is it difficult? Odd to think we have a perfect image of something long gone, so long gone it is totally mineralised. The trilobites spring to mind. I always find looking at fossil trilobites amazing. 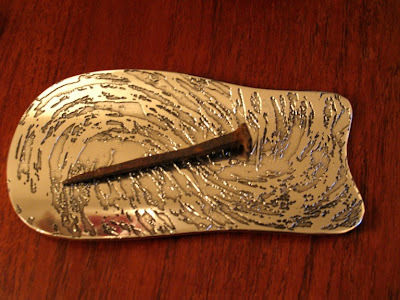 I love your collecion JMB :), especially the volcanic rock because it reminds me of Saba and the nail… how cool is that. I have a couple of containers filled with beach stones, sand & shells that I have collected from the various beached I have visited over the years. I have no ideas what has come from where, but collectively, they are reminders of those lovely times. I don’t know what a rosetta stone is so I’ll have to google it. See today’s post for fragrant chunks! I like the rocks raw and polished. 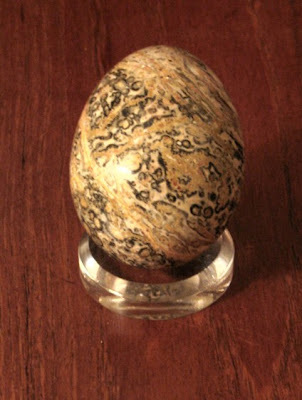 I love the leopard skin jasper too. Send me your email and I’ll tell you how to do it. Isn’t it amazing? The wood especially amazes me but the fossil things are wonderful. Saba is volcanic too. Isn’t the nail great? I love it and treasure it. I have other rocks that I picked up on that table but can’t remember which is which. The ones I showed you I do know for sure. Just a beautiful rock display and photos, I looked very hard for opal! 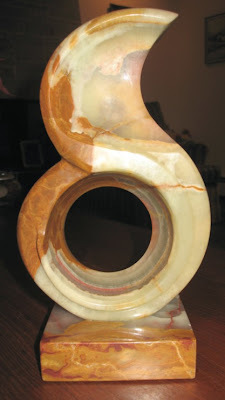 The petrified wood came close, it almost has the opal shimmer swirl, very beautiful.